The Cisco 7204VXR supports multiprotocol, multimedia routing and bridging with a wide variety of protocols and port adapter combinations available for Cisco 7200 series routers. 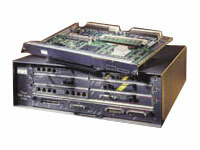 In addition, the Cisco 7204VXR midplane provides increased support for multiple high-bandwidth port adapters. It has slots for port adapters, for an I/O controller, and for a network processing engine or network services engine. This device operates as either a tabletop or a rack-mounted unit. A rack-mount kit is a standard equipment included with all Cisco 7200 VXR routers when they are shipped from the factory.